In keeping with our annual tradition, we have dedicated the next few pages to some of the year’s top stories. Many of this year’s MED cover stories have been all about growth and expansion. Sanford opened a new breast center, Avera expanded its transplant program, LifeScape introduced new options for autism, and Brookings welcomed patients to its renovated hospital. We also looked at the ways in which institutions across the region are working to manage their growth safely, efficiently, and cost effectively with help from telemedicine, hospitalists, and foreign-born providers. Is there someone or something you would like to see on the cover of MED in 2018? Send your ideas to [email protected] MidwestMedicalEdition.com. With the supply of US-born primary care providers and generalists dwindling and the healthcare needs of baby boomers on the rise, the contributions of these international medical graduates (IMGs) are more vital than ever, especially in underserved and rural areas like ours. One of those interviewees was Sanford Cardiologist Marian Petrasko, MD, PhD, a native of Czechoslovakia (from the part of the country that is now Slovakia). Dr. Petrasko applied to a US residency program shortly after the fall of the Berlin Wall and moved to Sioux Falls in 2004. IMGs like Petrasko make up about a quarter of doctors practicing in the US. Despite years of warnings about the dangers of antibiotic overuse, and despite ongoing research and development of ever more powerful antimicrobial agents, the bugs appear to be winning, Those on the front line of the fight against so-called “superbugs” say it may be a harbinger of things to come if we stay on the current course. Avera is utilizing its extensive existing telemedicine system to provide the expertise that smaller institutions need to get a handle on antibiotic use and comply with new antimicrobial stewardship standards established by the Joint Commission in January. 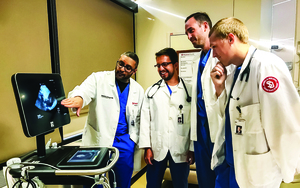 “What we have done is develop a model for implementing this in small, rural hospitals using technology and the resources we have,” says Infectious DIsease specialist Jawad Nazir, MD. Pharmacists at nine Avera facilities have been trained to watch for red flags such as patients on two or more antibiotics for more than 48 hours, those who may be on the wrong antibiotic, any patient with a C. diff infection, and others. After review, Dr. Nazir or one of his four infectious disease partners may recommend deescalating the antibiotic dose, changing medicines, or even stopping a particular antibiotic. This spring, with an eye-catching new space and integrated approach to breast health, including screening and diagnostics, genetic testing and counseling, cutting edge treatments, navigators, an extensive biobank, and clinical research associates in one setting, the new 48,000 square foot Edith Sanford Breast Center was poised to turn some heads. And turn them it did. In February, Cancer Breakthroughs 2020 selected Sanford Health as one of three sites nationwide to launch the program’s first clinical trial, an immunotherapy vaccine for patients with unresectable or metastatic HER2-expressing breast cancer. The trial is just one of a dozen breast cancer trials underway at Sanford. Some are focused on new therapies while others are exploring symptom control, nausea prevention, risk factors, etc. “We have a reputation for getting these types of trials up and running quickly because we are an integrated health system,” says David Pearce, PhD, executive vice president for Sanford Research. 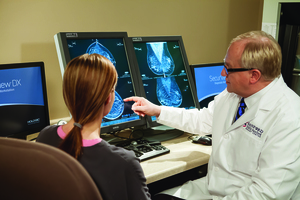 In addition to providing a campus home for breast cancer treatment, the Center also offers stereotactic biopsy for both prone and upright 3D imaging, contrast enhanced mammography, and whole breast ultrasound. Since the first Brookings Hospital opened its doors in 1964, the community has grown by 60 percent. With that growth have come changes in the community’s healthcare needs. More than 70 percent of Brooking’s patients now come to the hospital on an outpatient basis, in contrast to just 20 percent in 1964. Today’s patients are also sicker and have higher expectations. The 62,000+ square foot expansion and renovation project, which opened for business in February, took a little over a year-and-a-half but put Brookings decades ahead of where it had been in its ability to efficiently care for patients. 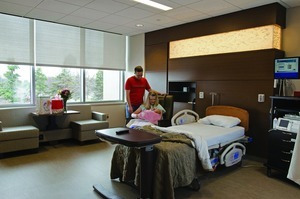 Larger patient rooms maximize patient-caregiver interaction and improve efficiency and larger ORs are fully-integrated with high-tech lighting and video capabilities. The five LDRP suites (up from 3) and redesigned entrance and public spaces are visible reminders of the hospital’s forward momentum while other upgrades, including the new HVAC system, private transport corridors, and new pharmacy, are less visible but just as vital to the hospital’s long-term success. “I’m a big proponent of providing the highest quality of care we can possible provide,” says CEO Jason Merkley. According to the CDC, one in 68 children is diagnosed with Autism Spectrum Disorder (ASD) – up from 150 in 2002. LifeScape is offering innovative and evidence-based new options for earlier ASD intervention. A child who has been diagnosed with ASD as early as 12 months can now receive multidisciplinary therapy through Early and Intensive Behavioral Intervention (EIBI) or through a new approach called the Early Start Denver Model (ESDM). Both models utilize principles of Applied Behavior Analysis (ABA). Under a new law, children with autism in South Dakota will be eligible to receive ABA services through the age of 18. Delivered under the direction of Board Certified Behavior Analysts (BCBAs), the EIBI approach consists of identifying which skills the young child lacks, breaking these skills into component parts, and working on these separately, until the child has mastered a sequence and can perform the task independently. ESDM utilizes a curriculum that includes ABA principles and addresses skills across all domains of development - fine and gross motor, communication, joint attention, activities of daily living, etc. - to provide a multidisciplinary approach for very young children and their families. 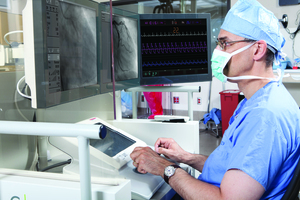 Hospital medicine is the fastest growing medical specialty in the history of American medicine. Today, with the profession now 20 years old, hospitalists, who come from many different specialities including family medicine, internal medicine, pediatrics, even Ob/Gyn and cardiology, are being defined in terms of their own pivotal role in the medical system. While the largest health systems in South Dakota have had hospitalist programs in place for some time, a growing number of rural facilities and smaller hospitals are also now coming on board. Prairie Lakes Hospital in Watertown has six hospitalists (some of whom are locum tenens) and one nurse practitioner providing care 24/7 and benefitting both the hospital and community in multiple ways. It has been a year since South Dakota medicine reached a major milestone when Avera Transplant Institute performed the region’s first-ever liver transplant in Sioux Falls. It was the culmination of an evolution that began in 1993 with the region’s first kidney transplant. “We now have the capacity to provide anything a patient with liver disease would need,” says Dr. Steers.